FDR and Eleanor. Mick and Keith. Jobs and Woz. There are countless examples of introvert-extrovert partnerships who make brilliant products, create great works of art, and even change history together. But these partnerships don’t just happen. They demand wise nurturing. The key, says bestselling author Jennifer Kahnweiler, is for opposites to stop emphasizing their differences and use approaches that focus them both on moving toward results. Kahnweiler’s first-of-its-kind practical five-step process helps introverts and extroverts understand and appreciate each other’s wiring, use conflicts to spur creativity, enrich their own skills by learning from the other, and see and act on things neither would have separately. Kahnweiler shows how to perform the delicate balancing act required to create a whole that is exponentially greater than the sum of its parts. Jennifer B. Kahnweiler, PhD, is a bestselling author and global keynote speaker known as the “champion for introverts.” As a thought leader on introverted leadership, she has worked with major organizations including GE, NASA, CNN, and the CDC. 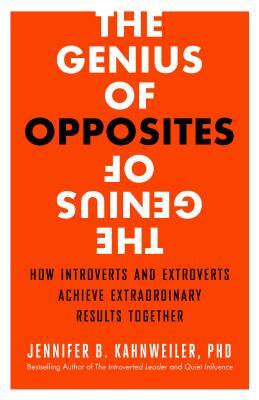 Kahnweiler (Quiet Influence) asserts that introvert-extrovert relationships are most successful when opposites stop focusing on their dissimilarities and apply approaches that steer them towards results. She posits a five-step, “ABC” process by which to do this: accept the alien, bring on the battles, cast the character, destroy the dislike, and realize that each can’t offer everything. Her advice to both intro- and extroverts to be patient with and learn from the other promises superior results. VERDICT: Helpful in comprehending and appreciating the differences in others.